Tag Archives: SERIOUS BREW. CO.
Just down the slope from Howe Caverns inside a pale-yellowed roadside dive posing as a Wild West outpost in the foothills of Schoharie County, SERIOUS BREWING COMPANY opened up springtime 2016. 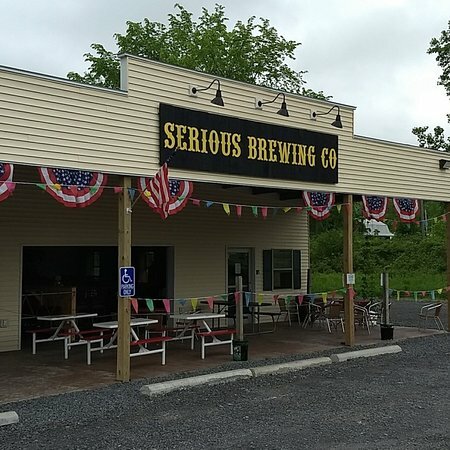 A proud farmhouse brewery utilizing local ingredients, Serious has a small covered deck leading to the entrance of the diminutive oak-walled pipe-exposed pub. Robin Butts BBQ serves food to go alongside the handcrafted suds. Ciders, spirits, wines and original cocktails were also available. Caramel-spiced toasted barley malts sprung from Running Coat Red Ale, picking up a small coffee nip at the fruity finish. Sweet orange peel, grains of paradise and coriander settled atop Schoharie Burning Wheat Ale, leaving gooseberry-soured tartness and herbal fungi Belgian yeast funk upon its fragile white wheat base. Sulfite-infused experimental beer, Amber Waves Of Grain, let sweet honey-grained mango receive a mild habanero burn, retaining a light pilsner mouthfeel that relegated its peppered mango heat. Spicy citrus sweetness contrasted herbal-peppered Belgian yeast and ethyl alcohol burn for feisty Bine Of My Existence IPA, serenading juicy grapefruit, orange and tangerine tanginess with sugared pale malting. Sweet brown chocolate and bitter Madagascar vanilla enriched delightful George The Inventor Winter Porter, allowing coconut, marshmallow and hazelnut illusions to permeate the sugared mocha continuance. Black chocolate, mild coffee and raw molasses enveloped bittersweet ALCO Oatmeal Milk Stout, a smoothly milk-sugared dark ale with musty earthen hop resin.